The latest edition of Papers & Pixels magazine just came out. I took a few minutes to quickly skim through the magazine and there are so many awesome projects and ideas this month! I for sure will be going back to try several of the projects. My contribution to the magazine this month is a tutorial to create this cute dancing leprechaun pop up card. He literally pops up and starts to do the jig!! You can purchase the latest edition for only $1.50 or subscribe for only $12 a year. What a bargain! Check it out HERE. I used a ton of awesome goodies from the latest release over at Peachy Keen Stamps. 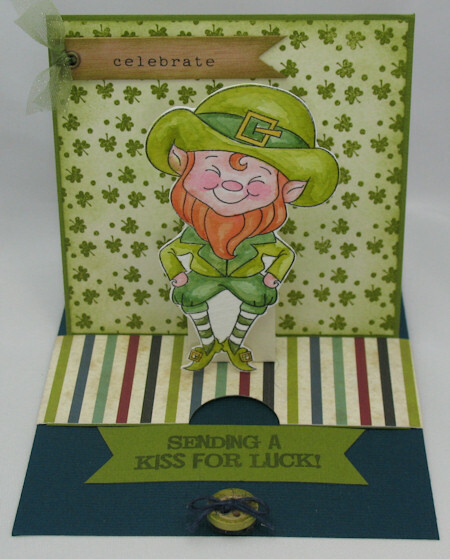 Check out the paper crafting kit and the sweet little leprechaun stamps HERE and HERE. Oh how totally FUN is that?!?!?! LOVE this Kim!! !